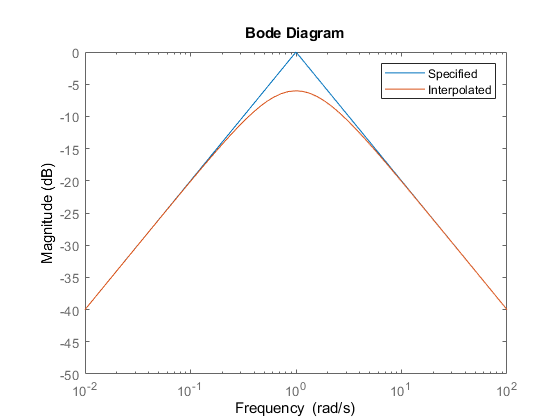 This example gives a tour of available frequency-domain requirements for control system tuning with systune or looptune. 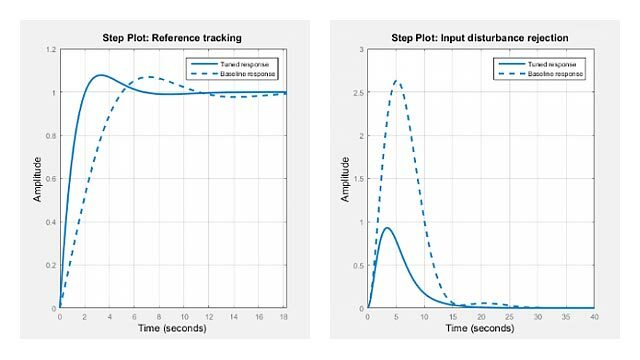 The systune and looptune commands tune the parameters of fixed-structure control systems subject to a variety of time- and frequency-domain requirements. The TuningGoal package is the repository for such design requirements. specifies that the gain from d to y should not exceed the magnitude of the transfer function . It is often convenient to just sketch the asymptotes of the desired gain profile. For example, instead of the transfer function , we could just specify gain values of 0.01,1,0.01 at the frequencies 0.01,1,100, the point (1,1) being the breakpoint of the two asymptotes and . 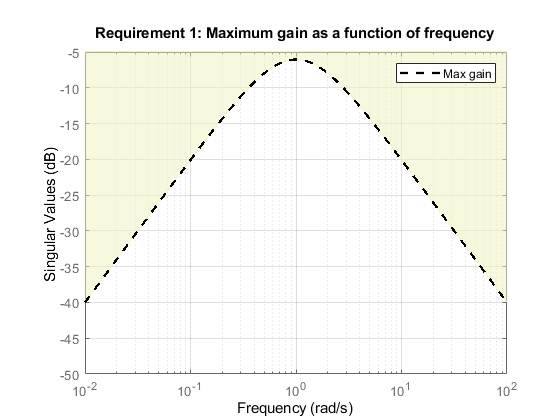 The requirement object automatically turns this discrete gain profile into a gain limit defined at all frequencies. limits the output variance of y to for a unit-variance white-noise input n.
specifies that V should track Vsp and w should track wsp with minimum cross-coupling between the two responses. 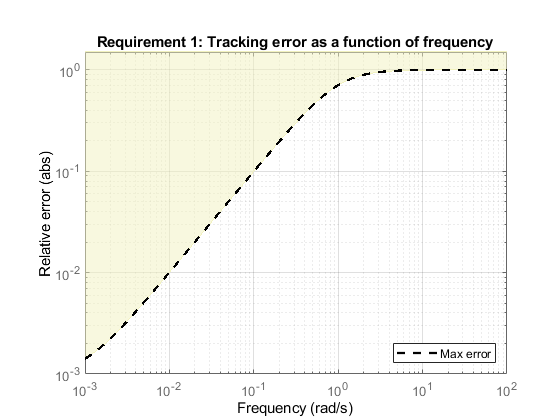 Tracking requirements are converted into frequency-domain constraints on the tracking error as a function of frequency. 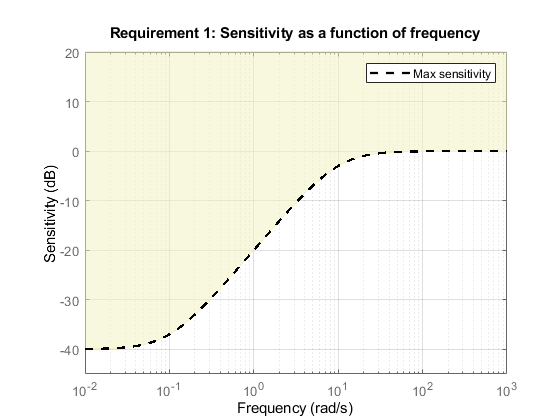 For the first requirement R1, for example, the gain from r to the tracking error e = r-y should be small at low frequency and approach 1 (100%) at frequencies greater than 1 rad/s (bandwidth for a two-second response time). 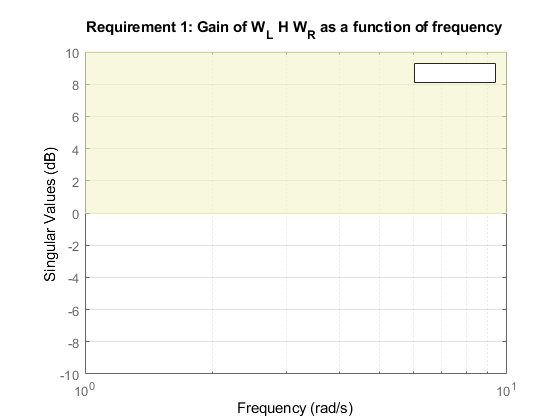 You can use viewGoal to visualize this frequency-domain constraint. Note that the yellow region indicates where the requirement is violated. where is the loop transfer function measured at the disturbance entry point. 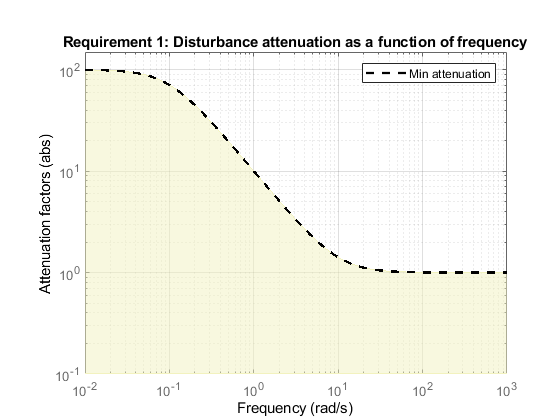 The gain of is the disturbance attenuation factor, the ratio between the open- and closed-loop sensitivities to the disturbance. Its reciprocal is the sensitivity at the disturbance input. Figure 1: Sample feedback loop. 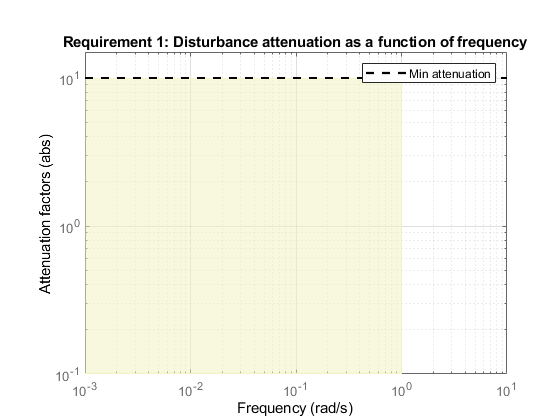 specifies that a disturbance entering at the plant input "u" should be attenuated by a factor 10 in the frequency band from 0 to 1 rad/s. specifies an attenuation factor of 100 below 0.1 rad/s gradually decreasing to 1 (no attenuation) after 10 rad/s. is equivalent to the rejection requirement R2 above. The sensitivity increases from 0.01 (1%) below 0.1 rad/s to 1 (100%) above 10 rad/s. Note that this is a normalized gain constraint (unit bound across frequency).